At some stage of our existence my mother joined a Coal Club at 2/6 (Two shillings and six pennies) a week. A man called to the house every Friday night to collect the money. He had a certain amount of customers who made up the ‘Club’ and he would call on these each week to collect the subscription for the coal. When each of his customers had received their coal then the’Club’ would start over again. Each customer got their coal delivery in turn. 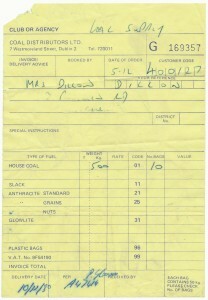 My mother always seemed to go into town for something or other and on the occasion when the coal man was due she’d leave strict instructions with one of my older brothers to make sure to count all of the bags of coal as they were brought into our kitchen and emptied under the stairs in the coal hole. On a winters evening it would be quite dark and cold outside. We’d all huddle together around the fire listening to the rain lashing on the kitchen window, tap tap tapping trying to get into our nice warm kitchen. The flames from the fire would throw long black eerie shadows across the ceiling and onto the wall by the old Belfast kitchen sink. It was like a scene from Charles Dickens novel ‘Great Expectations’. Then all of a sudden a great hammering noise would shake the house and make all of our little hearts miss a beat in terror at the noise being hammered out on our hall door. The coal man had arrived. On opening the door a great giant of a man covered from head to toe in black coal dust stood humped over and stooped with a great big sack of coal on his back. We’d all sit in terror of this dark stranger as he stomped in and out of our kitchen. Under our breaths we’d all count, one bag, two bags, three bags until all eight bags of black glistening coal was emptied out. The coal dust would ever so gently drift down and settle on the gas stove, the draining board and the sink. 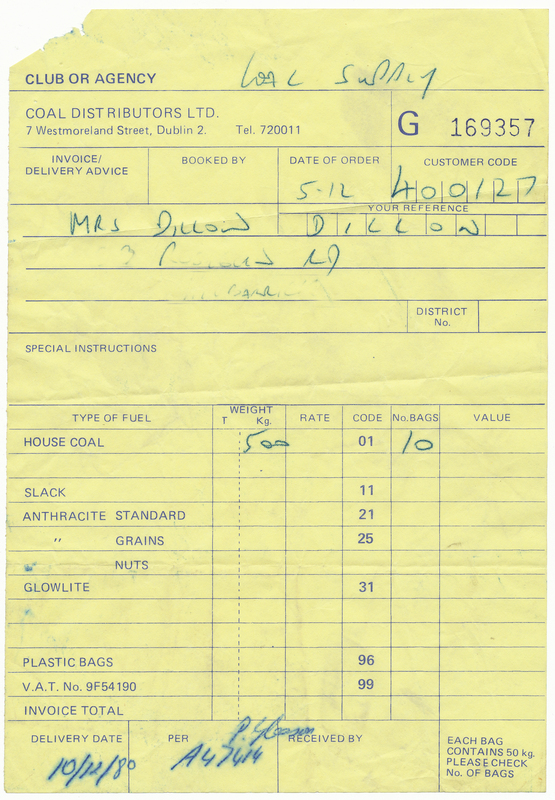 The coal man would make a deep grunting noise to my brother who would grab a pencil and carefully write his name on the delivery docket to say that he had personally counted eight bags of coal being brought into the house. As quickly and as noisily as he came, the coal man left. The hall door slamming shut behind him. When my brother had settled back into his place by the fire we’d ask him what the coal man had said. He’d look around at each of our faces, then mimicking the coal man he’d suddenly let out a great big grunting noise and we’d all roar out laughing.